American jurist; born at Hovestadt, Westphalia, Prussia, Nov. 20, 1858. He attended the gymnasium at Paderborn, Westphalia, until his fourteenth year, when his parents emigrated to the United States, settling in Gadsden, Ala. Here he attended the Southern Institute, from which he was graduated in 1877, whereupon he took up the study of law at the College of Cincinnati, Ohio. In 1881 he was appointed chief of the bureau of statistics of the state of Ohio, and during his term of office he revised the system of compiling statistics; he also published at Columbus a year-book of the history of Ohio. 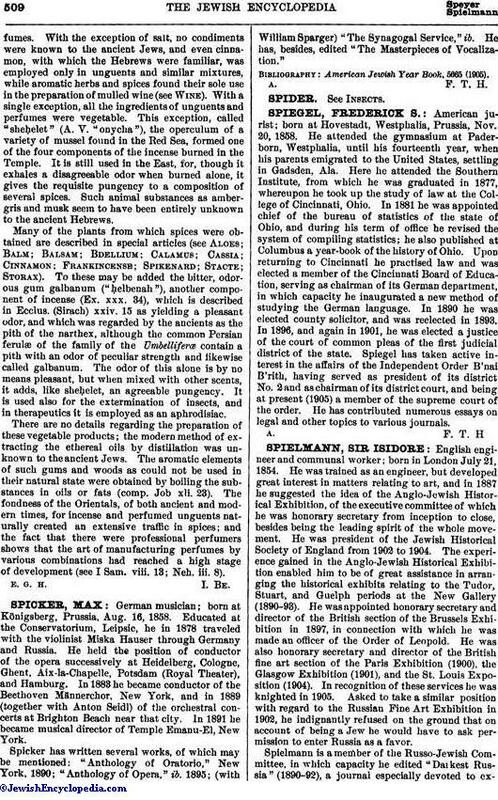 Upon returning to Cincinnati he practised law and was elected a member of the Cincinnati Board of Education, serving as chairman of its German department, in which capacity he inaugurated a new method of studying the German language. In 1890 he was elected county solicitor, and was reelected in 1893. In 1896, and again in 1901, he was elected a justice of the court of common pleas of the first judicial district of the state. Spiegel has taken active interest in the affairs of the Independent Order B'nai B'rith, having served as president of its district No. 2 and as chairman of its district court, and being at present (1905) a member of the supreme court of the order. He has contributed numerous essays on legal and other topics to various journals.